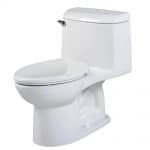 In this American Standard Cadet 3 review, we will focus on a combination tank and bowl toilet system.It features a concealed trap-way, elongated, white toilet set. The product comes with a seat and has a large flush valve. 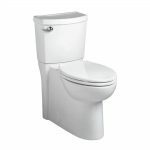 One significant aspect of the toilet is its use of a top mount, slow-closing seat with a seamless lift-off cover. The fixture has a clean, shiny, virus-resistant finish and a siphon action jetted bowl. There is also a hidden, smooth-surface trap-way.It weighs over 100 pounds and operates on WaterSense and Comfort Height capabilities. American Standard Cadet 3 is a 2-piece, water-saving system utilizing smart gravity technology. 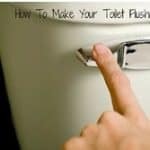 It handles flushing in one easy go, with fewer clogs. The Cadet 3 toilet combines high performance with low-water consumption. It features EverClean surface glazing with a patented silver-ion coating. The protective barrier withstands fungus, mold, algae, and mildew. The toilet is available with an elongated or round front design.It has a large siphon trap-way and extra-wide flushing valve. These systems are durable and force significantly more waste than regular toilets. The water-efficient design flushes quickly while using less water per gallon. When preparing this American Standard Cadet3 toilet review, we also found that it highlights a super- fast, water-saving flushing action. The Cadet 3 flushing component process as much as 1,000 grams of bulk waste in one flush. The EverClean smooth surface helps make cleaning more comfortable and more hygienic. The massive siphon action and trap-way help minimize clogs for a cleaner, stress-free flush after use. A pressurized rim allows the bowl to power-wash itself. The technology uses trapped air inside the tank which forces the water from specific rim holes to clean and sanitize the bowl. The Cadet 3 toilet is a high-performing, low-consumption system that uses up to 20 percent less water than regular toilets. It amounts to at least 1.28 gallons of water per flush. The siphon and trapway capabilities are also larger than standard toilets. 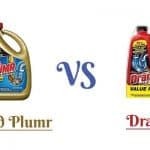 It means there are fewer clogs and flush significantly larger quantities of bulk waste.The systems work quickly and efficiently while utilizing less water to thoroughly flush the toilets. The flush valve opening is also broader than standard toilet valves. It lets more water into the bowl over 80 percent quicker than those with 2-inch pipes. The Cadet3 toilet ranks in the 50 best commercial 2-piece toilets available.The flushing technology produces faster, stronger action each time you flush. It’s EPA WaterSense certified for high-efficiency and approved for use by person with disabilities. The system rates as the highest performing toilet in its range by processing 1,000 grams of bulk waste in a single flush.Smart Gravity technology also helps build its reputation for a consistent, one-flush action with fewer clogs. The other flushing components also combine to produce a toilet that uses significantly less water, while maintaining a cleaner bowl. The fast, powerful flushing mechanism of the Cadet 3 toilet does not compromise the superior workings of the unit. The sturdy flushing valve will not twist or warp under pressure like some valves. 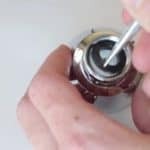 The body of the bowl has a Vitreous China coating which produces a non-porous body that withstands leaks, rust, and corrosion. EverClean is a patented, permanent silver-ion preservative in the bowl surface. The antimicrobial coating has a long-lasting seen that remains clean for extended periods even after normal wear and tear. The glazed surface helps protect the bowl surface from staining, fungus, algae, mold, and mildew. The American Standard Cadet 3 toilet is easy to maintain. The flushing system takes care of large quantities of bulk waste and helps control the incidence of clogging and blockages. There’s no need to plunge. There’s also a power-wash, pressurized rim that scrubs the bowl after each flush. It reduces the need for chemical cleaners.Other hygienic features help reduce bacteria and other particles from building up on the surface. The bowl surface wipes clean with warm, soapy water and a regular shining. The smooth, glossy surface and color remain in good condition for many years. So in our final American Standard Cadet 3 review, we found that it’s replete with qualities that set it apart from other toilets. I endorse this toilet for efficiency, comfort, and durability. It combines water-saving abilities with power-flushing action that is fast and effective. There’s a pressurized rim to power wash the bowl, and EverClean technology to preserve the bowl surface. It is high-performing and eliminates and minimizes clogs and reduces maintenance costs. ComfortHeight technology makes it suitable for taller users and those with disabilities. WaterSense capability results in less water use per flush. It helps save water and is kinder to the environment.